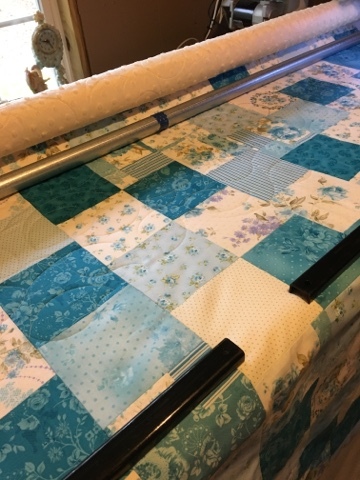 There is just something so soothing about a blue quilt (I'm not really a blue fan). This quilt just makes me smile. 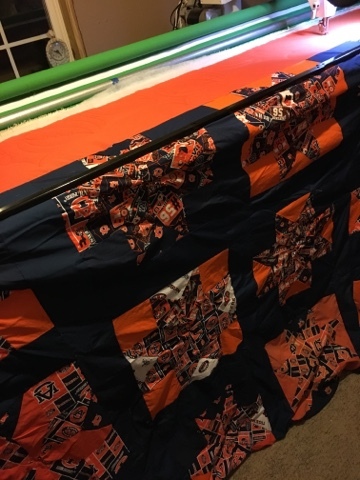 Yep there is one... sometimes you have to work on an Auburn Quilt! The good news, just like any quilt there is a story behind this one and a young man waiting to love it. 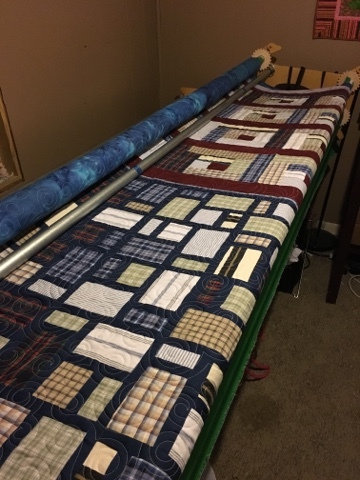 This quilt was made by his mom years ago but she passed away before she was able to finish it. A lady, Loretta, that goes to church with him found out about it and she finished the top. 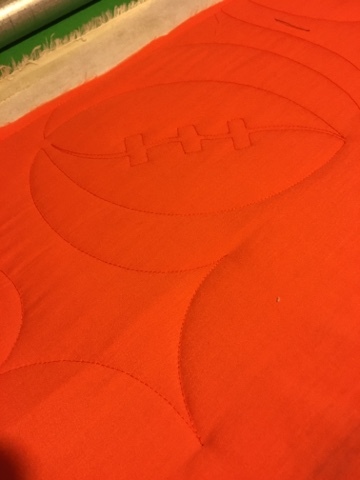 Now I have the honors of quilting it for him. Auburn and all, I love it. 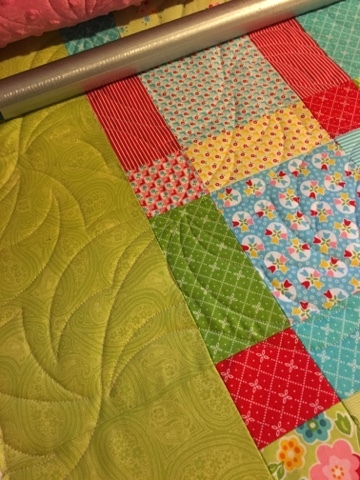 My favorite quilts, as I have said many times, are memory quilts. So many memories, tears and love go into these. 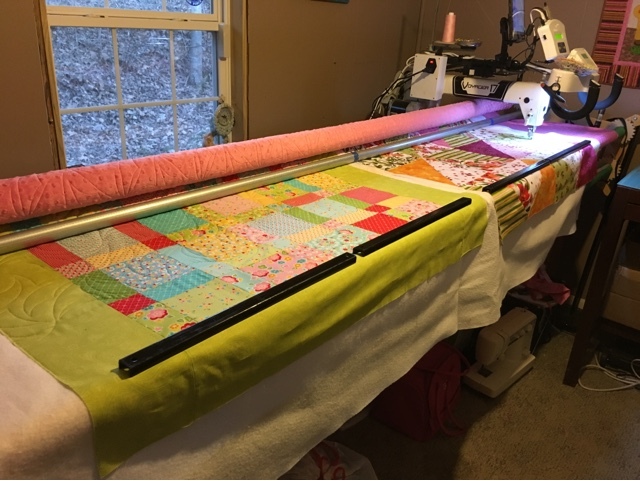 These two quilts belong to a sweet customer. She recently lost her husband and wanted to give her boys something to treasure from their father. 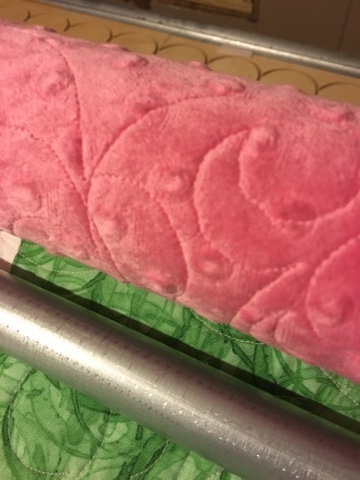 You can see the fabrics are primarily the same in both both the are very different. 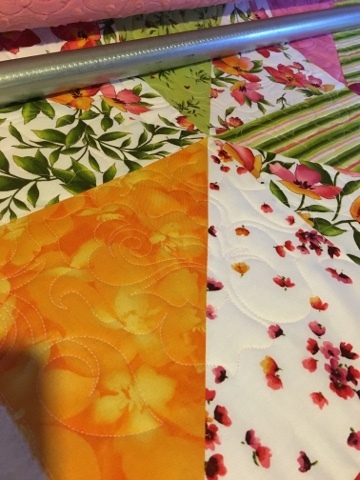 Because she chose different patterns I felt they deserved different quilting designs. I am sure both the boys will realize how special these are and will treasure them for years to come. 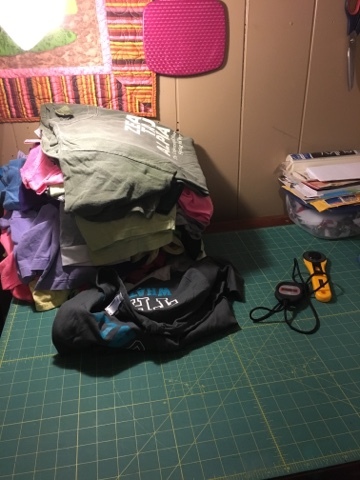 As these were being quilted, I also worked on getting some Tshirts ready for quilting. Nothing like a good process and assembly line. These three are cut and boxed (using very good line clearance so we don't have any mix ups). These are in the process of being cut. Once they are all cut out I will start the stabilizing process and layout. These are all being made based on a new Craftsy.com class that I recently watched. I can't wait to see how they turn out. So this isn't something I get to do often but I try when I can. 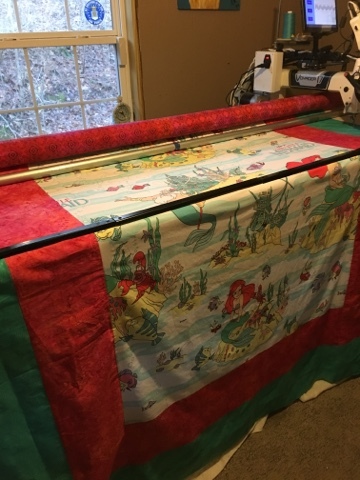 Two quilts loaded at the same time with two different designs. Saves a little time on loading and in this case, saved some dollars for the customer. I was able to use less batting with not as much waste. Love it! Gotta get busy again! Yep, it's minky. 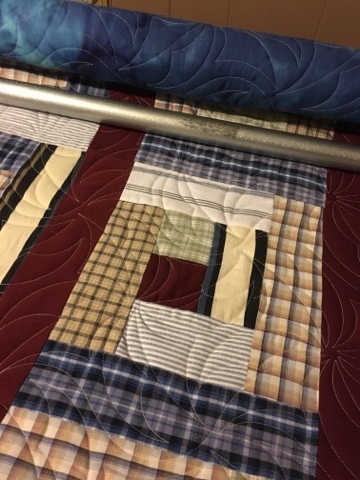 I just love quilts with a minky or flannel back. 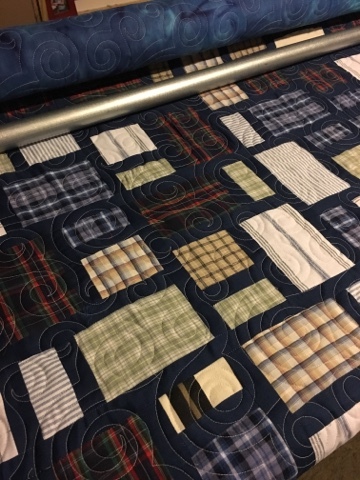 The quilting shows up beautifully and they are so warm and cuddly. 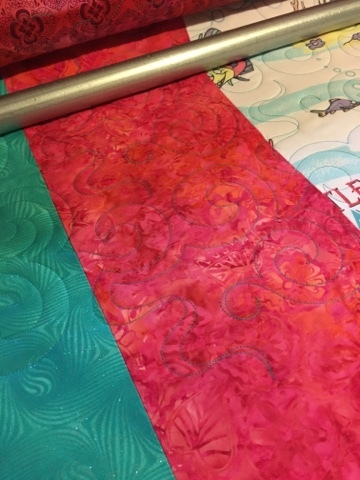 I say all the time that quilting to me is about memories. 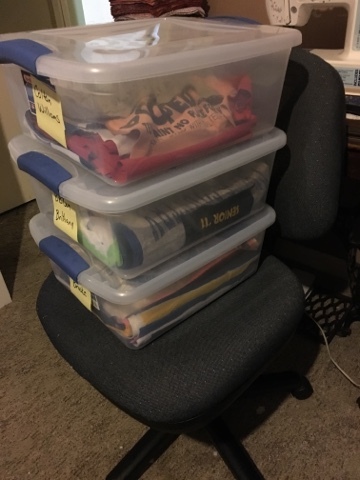 It is such a blessing to be a part of preserving someone else's memories. 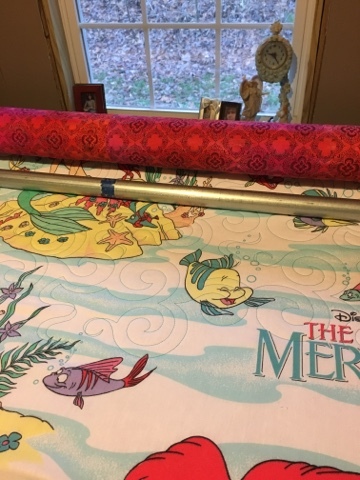 When looking for a quilt design I found this pattern called "Under the Sea". Sounds perfect doesn't it. I am so blessed that so many people trust me with their treasures. 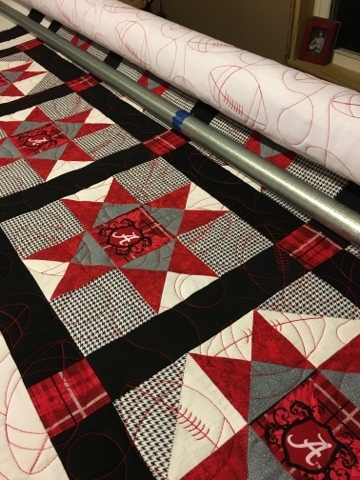 Just finished this beautiful quilt from a customer, Sherry Nin! She does very detailed work and always does a fantastic job! 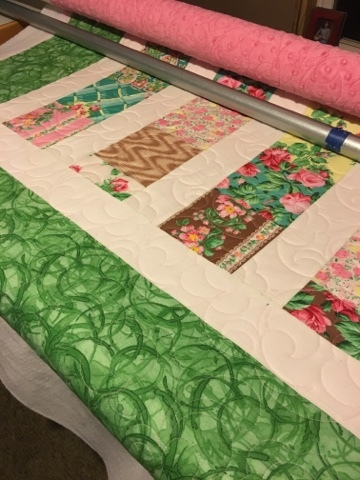 It is a pleasure to quilt for her.